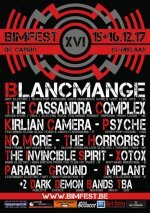 BIMFEST 2017 - Line-up complete! Warning ! Teaser / Spoiler alert! Yes! We did it again! The BIMFEST 2017 line-up is a fact! Soon the full line-up will be announced but while the BIMFEST website is under construction we like to tease you already a bit with this preliminary poster poster! Be aware the Early Bird combi-ticket pre-sales have already started and and are strictly limited to 100 pieces!So save some cash and order your tickets now! A soon as those are gone normal pre-sales combi-tickets (2days) and separate day tickets will go on sale at normal pre-sale prices. 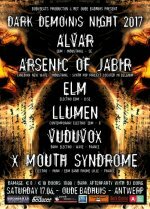 Dark Demons Night 2017 line-up confirmed! We are happy to announce to you the six bands that will be performing at our 3rd Dark Demons Night! Because this year there were nine candidates and only six available slots for bands to perform at the Dark Demons Night a voting poll was organized in order to let the people decide who they wanted to see live on this night. And it was an exciting poll until the end (at midnight on April 1st) and for some it was a very close call but here they are, the six bands that will try and convince friend and foe of their musical and performing skills on Saturday June 17th in the magnificent Antwerp venue, Het Oude Badhuis! So why should you come and see these band? Because they need your support and encouragement to keep on kicking against the pricks and oh... yeah... Because every visitor will be given a ballot paperl to write down their appreciation for EVERY band. The two most favored bands will also be given the opportunity to open up the 16th edition of the renowned Belgian Independent Music Festival in December this year! So let's go and support! Belgian electronic pioneer Dirk Ivens, also known for his work with Sonar, Absolute Body Control , Blok 57, S/HE and ex-singer of The Klinik, unleashes the eagerly awaited new album of his cult project DIVE. 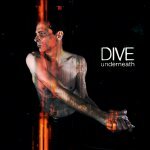 “Underneath” is another piece of dark minimalist Electro-art with an evolving sound. After a hiatus of more than a decade (the last output was the complete backcatalogue released as a 8 cd boxset) Dirk Ivens' project DIVE finally returns with a new sign of life. For the new album “Underneath”, he has again teamed up with Ivan Iusco (who he worked with on “Concrete Jungle”) and Rafael M. Espinosa (his collaborator on “Behind The Sun”.) The result is a maelstrom of minimalist Electronica that ranges from fascinating to unsettling and that no other act can quite accomplish in the same way: Stripped-bare rhythms, dark, machine-like sequencers, psychotic synth-sounds that are expertly intertwined with cleverly placed noise-attacks and the distinctive, feverishly manic and ghostly raw voice of Dirk Ivens towering above it all. Some tracks, like the groovy “Far Away” or the hammering “Something” have turned out surprisingly catchy, but as a whole “Underneath” is a menacing behemoth that relentlessly pulls the listener into its dark machine world. The album feels like a David-Lynchian fever dream, oscillating wildly between cutting Industrial-loops, dark Minimal-art and groovy Electronic-Body-beats that converge into a physical tour de force. In their effectively relentless reduction of their sound to the bare necessities, DIVE yet again manage to create a one-of-a-kind experience. “Underneath” is released on the German based label Out Of Line on CD and as a limited LP edition in classy dark green vinyl, containing the CD in a slip case as bonus. With a minimum on equipment, armed with a minidisc, megaphone and two stroboscopes, Dirk Ivens creates a maximum of power and he proved worldwide on many stages that less means more. Ghost & Writer confirmed as support for the Convenant show in Antwerp! We are happy to announce Ghost & Writer will be supporting Covenant on their exclusive Antwerp clubshow. Ghost & Writer is a project from Frank M. Spinath (Seabound/Edge Of Dawn) and Jean-Marc Lederman (The Weathermen, etc), who made their live debut in 2016 at the JH Wommel (Antwerp) last year. A concert that was very well received by all! The live set will see them playing songs from their two albums out on Dependent and Metropolis ("Shipwrecks" and "Red Flags", the latter being heralded as a true masterpiece by many reviewers, plus some audio surprises. Covenant returns to Belgium after 5 years hiatus! 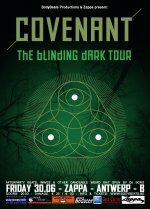 After a hiatus of more than 5 years the Swedish Electro band Covenant returns to Belgium to present their latest and global critically acclaimed album ‘The Blinding Dark’. The last time they played Belgium was at the Rewind Festival (RIP) at De Vooruit Ghent. So we are extremly proud to announce they accepted our invitation to play at on of our regular venues, Zappa and this on Friday June 30th. Like the tradition demands, there will be also a support band and afterparty added to this night. The name of the support band has still to be announced but we know already DJ BORG will spin on the after-show party. More info and tickets can be found on the link below. Check(in) on our Facebook event page and see who else is going already!